Wow, it was over a year ago that I met my friend, PowerShell developer Lee Holmes at PDC 05. As a fan of scripting and Unix, I was excited after attending a session on Microsoft’s new shell, codenamed “Monad.” After the session, I went to the Microsoft’s lab to play around and there was Lee.. my dream nerd. Lee was really down to earth, ultra smart, very helpful, had a passion for technology and even had a few BBS days stories to share. He showed me a few awesome things about Monad, which was an early beta a the time. Fast forward a year and a few months later, I’ve spent only about an hour playing with PowerShell betas but I did get in a weekend at Lee’s in Seattle playing Zuma on his XBOX 360 and sharing poutine in Vancouver with him, his daughter Ariel and my lady companion Delia. 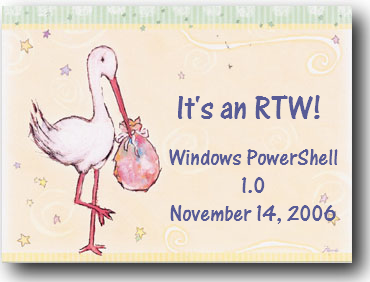 And of course, PowerShell is now at 1.0 RTW (Release to Web). You can read more at Lee’s blog, Precision Computing. Oh and by the way, if you would like to modify the color scheme (the red on black on blue error messages don’t do it for me), visit myITforums.com to learn how.